Fred Busse, director of Sycamore Public Works, explains some of the extraction of biosolids in a storage area for those biosolids in the city's wastewater treatment plant on Wednesday, Jan. 23, 2013. 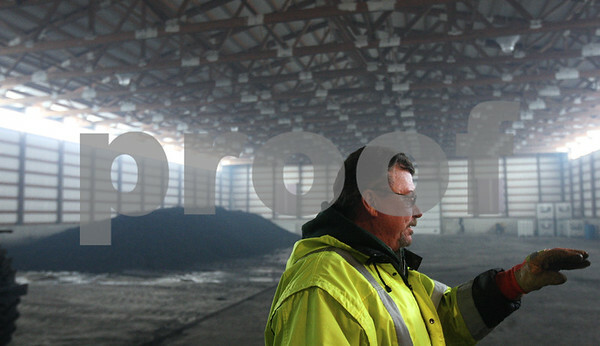 The biosolids, also known as sludge, are stored until city employees take the materials to a nearby farm that accepts them after crop harvests. The plant's renovations include plans for a centrifuge that will be able to de-water the sludge at a rate of 22%, an improvement over the 10% rate of the rotary fan press they currently use and also uses less chemical polymers.